Cordros Milestone Funds 2023 and 2028 are 5-year and 10-year Target Date Mutual funds aimed at helping you save towards your goals. This means that though they have been designed to invest in a mix of equities (stocks), fixed income and money market instruments like a typical balanced fund, their dates play a significant role in determining the amount that will be invested in these instruments. The funds will typically invest in more conservative instruments (bonds and money market) as their target dates approach. This can be seen in what is called the ‘Glide Path’. The Cordros Milestone funds were created as a result of the need to provide a long-term savings plan that helps to hedge against the eroding effects of inflation. Equites have been known to outperform other asset classes over a medium-long term horizon. I’m sure you are wondering, what happens to my money after the 5th and 10th years respectively given this glide path? Well, the fund will remain conservative and will continue to hold the monies in more conservative instruments (money market and fixed income) thereby providing safety. We advise that investors in the Cordros Milestone Funds should have a medium – long term perspective. What will I get when I invest in the Cordros Milestone Funds? We project a 21% return in the first year and the fund will pay out dividends on an annual basis to all unit holders (please refer to the prospectus for more information). Before you invest in the Cordros Milestone Funds 2023 & 2028, please seek professional advice from your Stockbroker/Financial advisor. 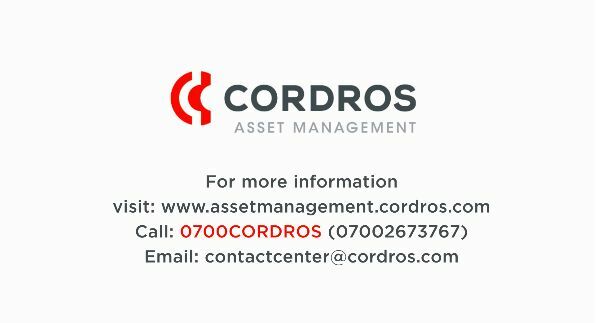 You can call us at 0700CORDROS (07002673767), email [email protected] or visit www.cordros.com for more information.